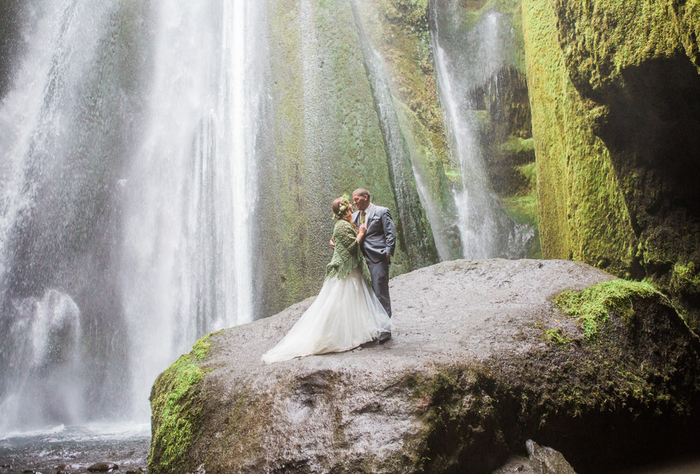 Katelyn and Travis knew they wanted a destination wedding in a location that reflected their fun and adventurous characters. After doing research online, they fell in love with Iceland and knew it would match their personalities. 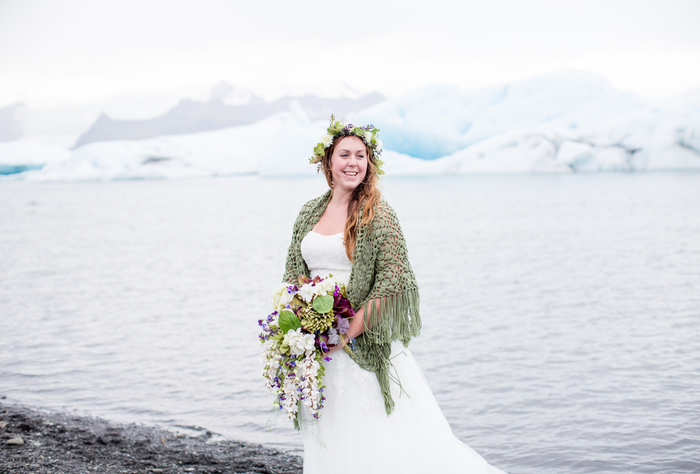 “We chose Iceland because it was different and it looked beautiful,” says the bride. The couple found Hotel Ranga, an extravagant log-cabin style hotel in Southern Iceland. From there, the staff recommended Gluggafoss for the ceremony site. It is a gorgeous green area with waterfalls and open land. “It was perfect and private. We were told how to get there on a paper map and we [simply] followed the directions,” says the couple. Traveling so far for the couple’s destination wedding was a surprise for their family and friends. The bride says, “They knew we were planning to go away to have the ceremony, but everyone’s reaction when we told them Iceland was the same. 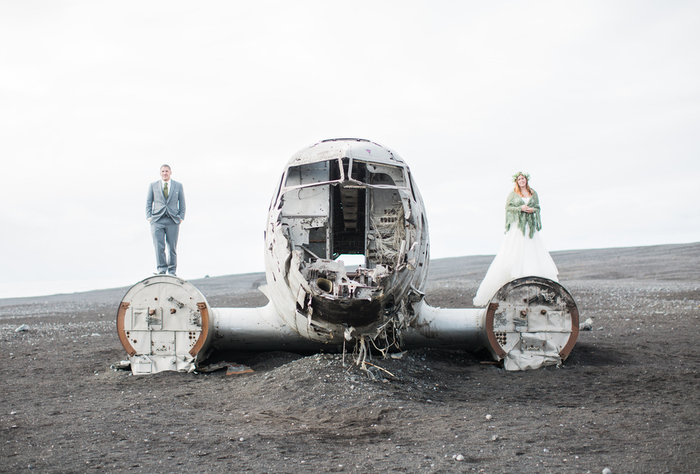 Mostly everyone reacted with a questionable shock ‘Why Iceland?’” The couple made it easy for their guests and kept them updated during all the planning stages. The couple shared, “Most of us bought our plane tickets at the same time so we got to travel together. We also rented two houses off Airbnb that slept 10 people each, so whoever wanted to stay in the houses could do that.” Itineraries were made and sent out ahead of time so guests had the choice to join in on the fun adventures Katelyn and Travis planned. The couple also made a binder with details for each day with maps, phone numbers and tour info to prevent any confusion. When planning their destination wedding, the newlywed didn’t run into any major problems. “We decided to save money and not a hire a wedding coordinator, so we knew the stress we were taking on and we were prepared for it. The event staff at Hotel Ranga were [thankfully] super helpful,” says the bride. Her friends also contributed to the workload by hand making the bouquet and flower crowns. The couple felt it wasn’t “them” to have a wedding in their hometown. We asked the newlyweds to give advice for future couples looking to have a destination wedding. “Don’t sweat the small things! People will question you and try to talk you out of ideas but see your vision and go for it,” they said. Vendors: Photographer: Caroline Morris, Ceremony/Reception: Gluggafoss, Stationery: Minted, Cake: Hotel Ranga, Gown: David’s Bridal, Grooms Clothing: Country Bride and Gent, Jewlery: Chloe & Isabel Boutique.